My husband turned 39 this year, and I really wanted to make the last birthday of his 30s a special one. One thing that I know he loves to eat is fondue. He’ll often suggest fondue for special dates together, so I knew he’d love it for his birthday party. Gathering around a fondue pot is always a great way to spend a little extra time with people you love. Plus, I think cheese and chocolate are always great for a celebration! This Cheese & Chocolate Fondue Party was the perfect birthday party idea for my favorite guy! 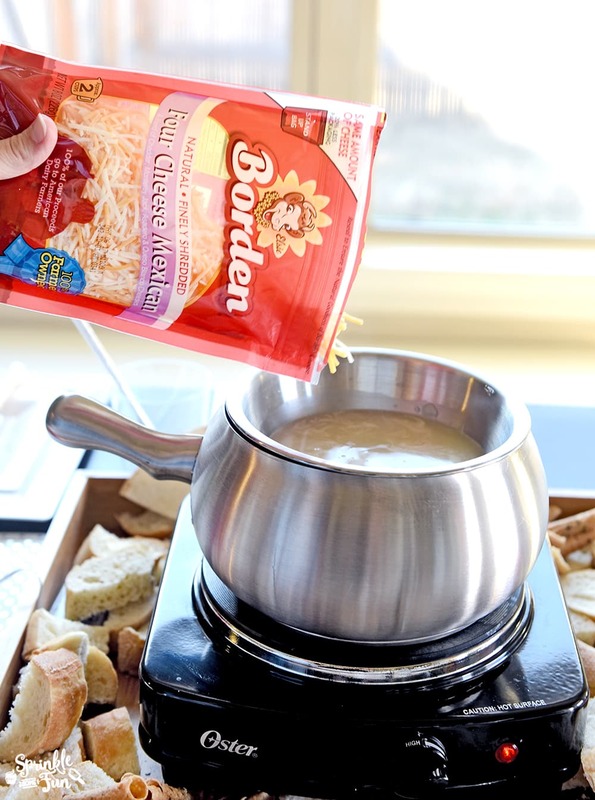 I made 3 different cheese fondues for our Cheese & Chocolate Fondue Party using Borden® Cheese. 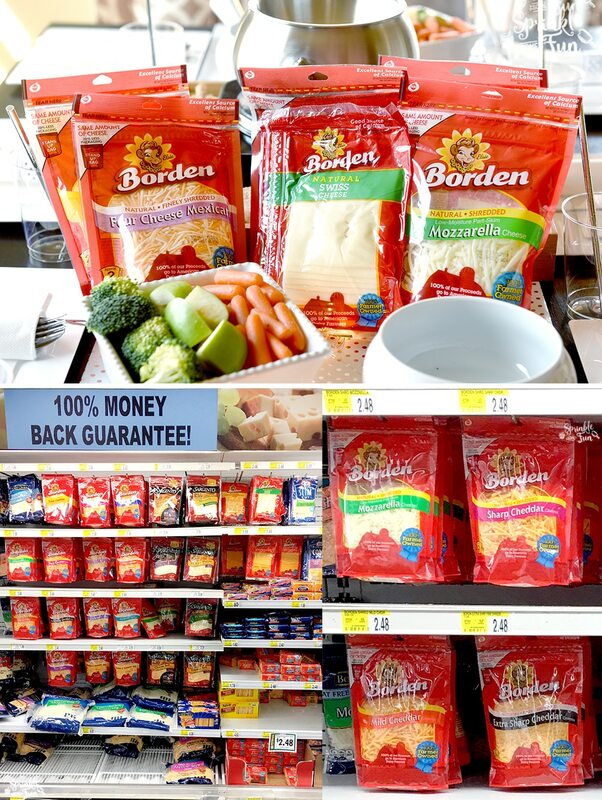 I found my Borden® Cheese at Super Save, but check out this store locator to find Borden® Cheese near you. The rest of the menu revolved around what we could dip in the cheese and all the yummy dessert ideas. What’s nice about fondue recipes is that you can also make them in a double boiler if you don’t own a fondue pot. I kept the party decor simple by using nice wrapping paper and tissue paper for some DIY party decor. I just folded up some wrapping paper in half for the table runner, made tissue paper flowers and used battery powered rice lights around the flowers in a small glass bowl for the main table. 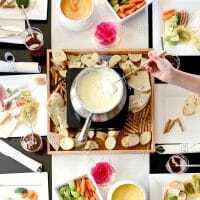 One thing to keep in mind about any table used for fondue is that it will get messy! Also, people will be reaching over and around the decorations. 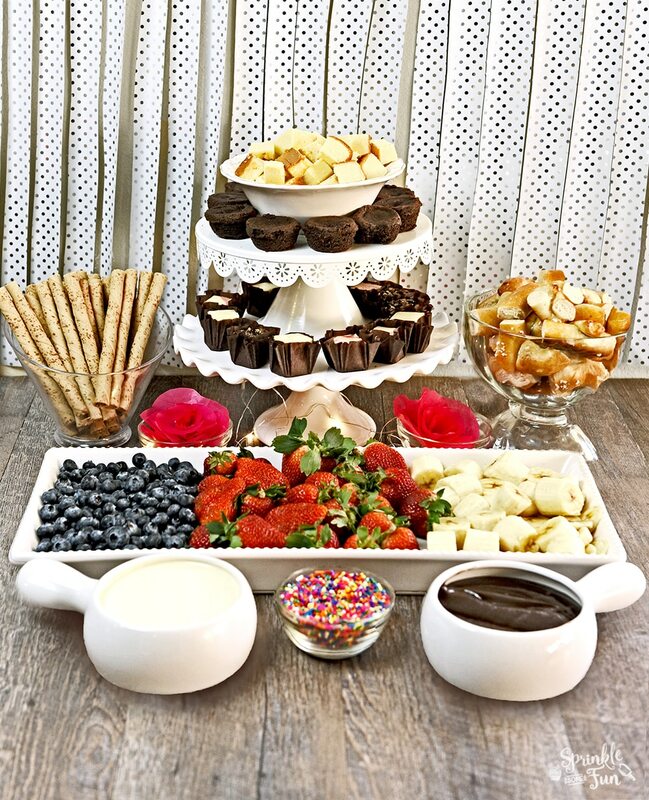 We also had a dessert table with white chocolate and dark chocolate fondue! I used various cake stands and bowls for the display and used the same wrapping paper from the table for a fun curtain backdrop. To make this wrapping paper curtain backdrop, just cut enough to cover the wall and then cut the paper into long thin strips up to about 3 inches from the top. Hang the paper with tape behind your table and you have a simple, but amazing dessert set up. Making the fondue is all part of the fun for a fondue party! We like to make it at the table while everyone is gathered around. The first cheese fondue I made was the Fiesta Cheese Fondue. I used Borden® Cheese Finely Shredded Four Cheese Mexican Shreds. We loved the Fiesta Cheese Fondue served with fresh veggies, flour tortilla chips, and corn tortilla chips! Once the cheese fondue is melted, I pour the cheese into a ceramic dish so I can make the next one. Everyone is invited to enjoy each cheese fondue as it’s made, so I like to use dishes with handles on them so we can pass them around! Depending on your fondue pot, you'll need to keep the pot at a low even temperature so you don't burn the cheese. 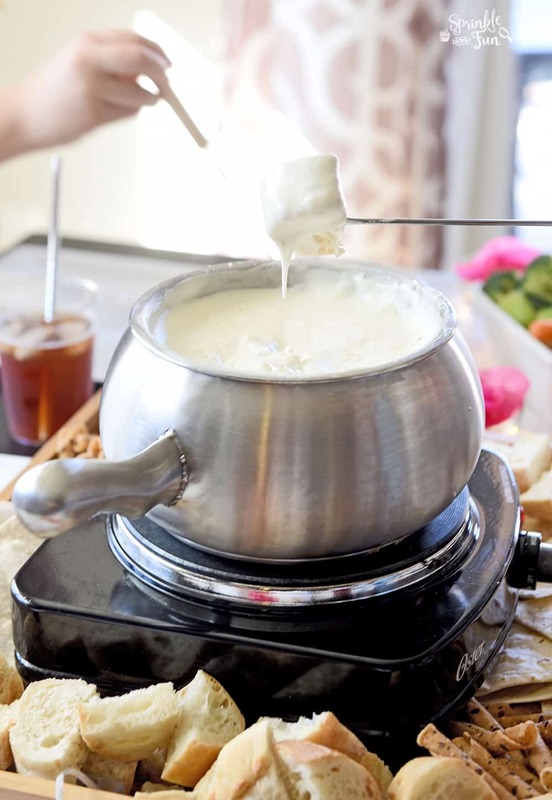 Add chicken broth and cornstarch to your fondue pot first, and quickly mix them together using a fork or whisk so the cornstarch does not clump up. Then add the rest of your ingredients and stir until the cheese is fully melted and smooth for dipping. You can transfer to another bowl, but use it immediately so that the cheese stays melted. Double boiler method: Just heat the double boiler so that the water from the first pot is steaming the second pot and then follow the recipe per the directions. Transfer the cheese to a separate dish for serving and serve immediately. The next cheese fondue I made was the Cheddar Swiss Fondue! This one was my personal favorite, and it tasted great with the crusty baguette slices and green apples, and was ooey-gooey delicious! I used Borden® Cheese Sharp Cheddar Shreds, Borden® Cheese Swiss Slices and fresh garlic for this fondue. Depending on your fondue pot, you'll need to keep the pot at a low even temperature (around 120 degrees) so you don't burn the cheese. Add chicken broth and cornstarch to your fondue pot first, and quickly mix them together using a fork or whisk so the cornstarch does not clump up. Then add the rest of your ingredients and stir until the cheese is fully melted and smooth for dipping. You can transfer to another bowl, but use it immediately so that the cheese stays melted. 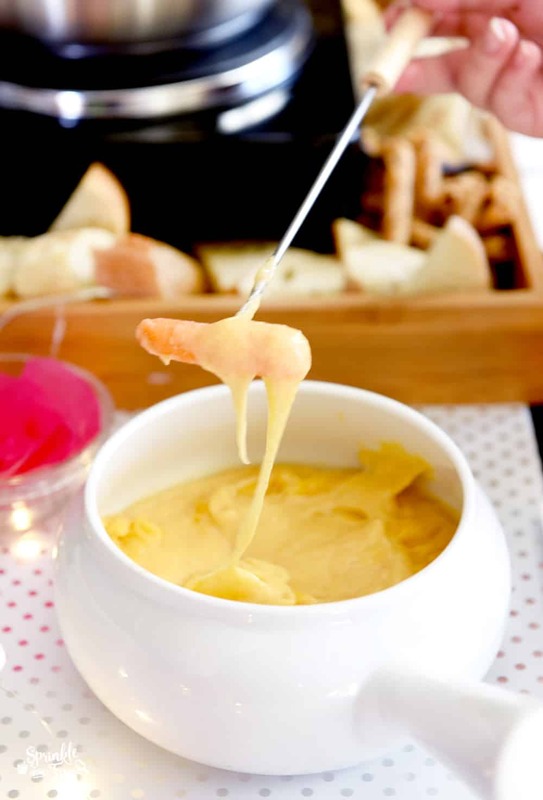 The last cheese fondue recipe I made was the Creamy Mozzarella Fondue! I made it using Borden® Cheese Mozzarella Shreds mixed with cream cheese and cream to make it extra smooth. 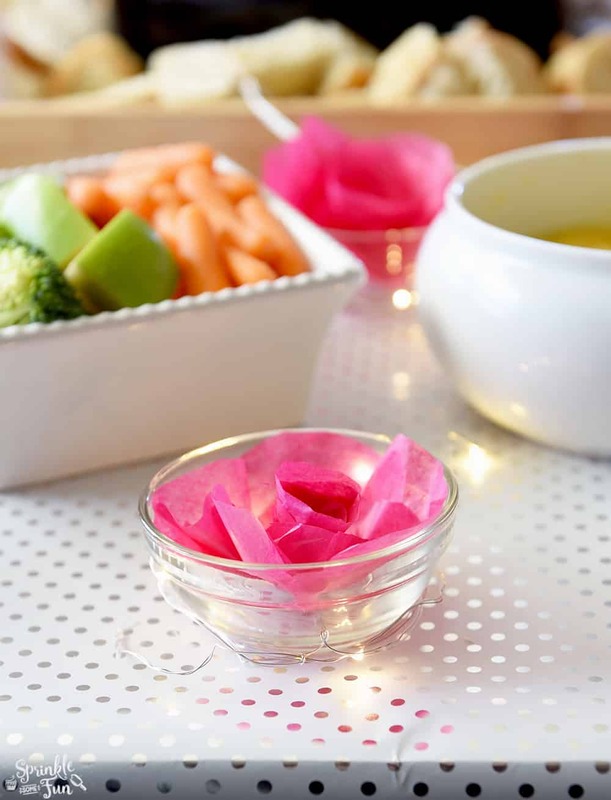 It was perfect for dipping ravioli and fresh veggies into! Once we were finished eating the cheese fondues, we dipped into some yummy chocolate fondues. I made simple white and dark chocolate fondues with all kinds of desserts for dipping. Fresh fruits like strawberries are perfect with chocolate. We also had fresh pretzel bites, brownie bites, pound cake, cheesecake bites, and cookie sticks for dipping. My husband really loves chocolate, and he loved the brownie bites with the chocolate fondue the most! Of course, since it was his birthday, I also added sprinkles on the table! In a double boiler or saucepan over low heat, warm up the whipping cream. Don't let the mixture boil. Melt the chocolate slowly, and stir until smooth. Add the vanilla and stir. Pour the melted mixture into the fondue pot (low heat) or a medium sized bowl (must use fondue while warm). 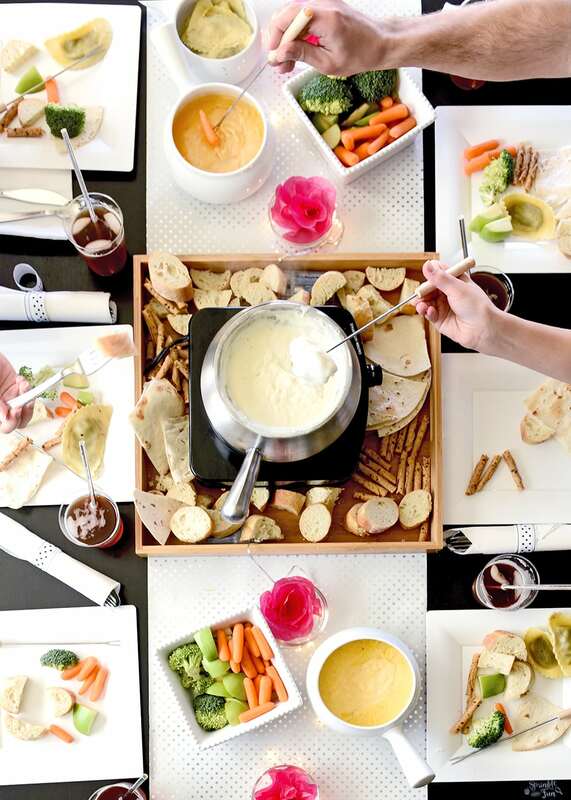 Have you ever hosted a fondue party? 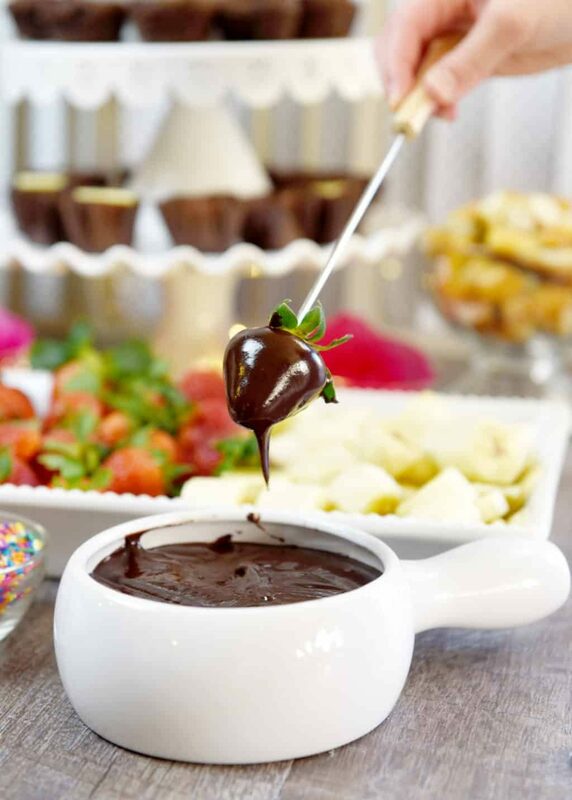 A Cheese & Chocolate Fondue Party is a great place to start!